When the new look Guardian homepage was launched in May last year, we noticed a passing resemblance to the Times’ site, which spent a rumoured £10m on an earlier revamp. Both sites adopted a layout that pushed the main content into the far left column (influenced, we think, by the simplicity of blog design, and usability studies / heatmaps), and introduced two right ‘sidebars’ for ads and promotional units. Now we have the new look Independent and it too seems to be using a similar design, by which we mean the underlying grid / layout and some common elements that are found across many of the world’s top newspaper sites. Is this a sign that a standardisation in newspaper website design is emerging? It would be no bad thing if this were the case. Let’s take a look at the similarities. All three now have a tab-style navigation in the header bar, and a similar layout on the front page, content on the left, ads and links on the right, spread across a pair of columns. Below the fold, the three are also broadly similar, though the Independent – despite increasing the focus on multimedia content - gives less prominence to video content and blogs than we see on Times Online and the Guardian. 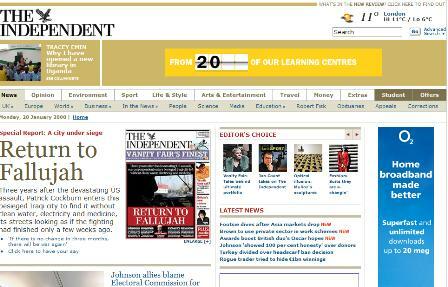 The typography on the Indy is excellent. Again, the combination of big serif fonts for headlines and sans serif for body text reflects recent online trends. In fact, a move towards standardisation in newspaper websites is good for readers, and it’s certainly something we recommend on e-commerce sites. Don’t reinvent the wheel unless you seriously need to. Think about it. Why must consumers ‘learn’ how to shop every time they visit a new retail site? And is there a competitive advantage to be had from changing the checkout, just for the hell of it, or ‘to be different from Amazon’? Users become accustomed to prevailing design standards, and therefore find it easier to use and navigate websites that follow best practice design conventions.